Dual Master Cylinder with drum brakes. I have a ‘60 with power drum brakes (booster on the firewall).Can I replace just my master cylinder with a duel master cylinder? I will be doing the disk brake conversion up front in the future, but I busted a hard line and I figured while redoing all the brake lines, I should change over to a dual master cylinder setup for added protection. You would have to find a drum/drum dual reservoir MC (rebuilt) from a 66/ FORD or possibly later MAVERICK. They were available manual or power. Just curious, could a disc/drum MC be used? The one chamber would be larger but would that be a problem? If it could be used that would save buying another one when doing the disc conversion. Also on Manual and Power differences, it seems that most of the Power MCs have a very short pushrod chamber and the Manual MCs have one that is a lot deeper. There are cautions about using a Power MC in place of a Manual - on the firewall - due to the chamber being short and the pushrod could fall off. I'm guessing it is because most that have power brakes have the MC in the front of the booster. That is opposite some of the TBirds (all 55-57) and some of the Square Birds (Under dash booster I think - need others input on that) which have the booster after the MC. ... That is opposite some of the TBirds (all 55-57) and some of the Square Birds (Under dash booster I think - need others input on that) which have the booster after the MC. Squarebirds that have the Kelsey-Hayes booster have a tab on the brake pedal arm that presses on switch on the K-H booster that opens a valve and uses vacuum to pull on the brake pedal arm - power assist. The pushrod goes from the brake pedal arm to the MC. The K-H unit is off to the side. The MC for K-H power brake system has a 1-1/16" bore rather than a 1" bore for non-power brakes thereby requiring less travel but more pressure on the brake pedal, which is more than overcome by the power assist. A dual M/C from a 67-68 Mustang should work. I would use a drum/drum M/C rather than a disc/drum since you have no proportioning valve. Thanks Howard. I understand it now. Ahhhh, I think I have it now. It is not just the bowl size but that the Disc/Drum MCs also "generally" have proportioning built into the rear circuit of that MC. 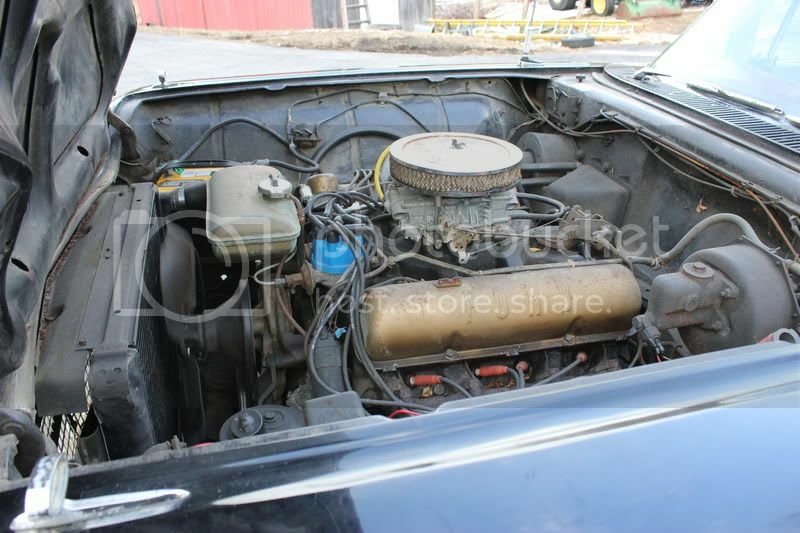 I used a drum/drum master cylinder for a 67 Mustang with drum all around and no power assist. I think it was about 50 bucks from NAPA. You will want to get one with the same bore diameter as your single master that you are replacing. Before I replaced the single master I also made dang sure the parking/emergency brake worked. I was reading your thread on your conversion, but I saw that you don't have a firewall mounted brake booster like me. Would I be able to use the same master cylinder that you used on my booster? Last edited by NYsquarebird58; April 8th, 2012, 09:31 PM. I was nervous about it not working, and so I took the old one to NAPA to see if the bore and the two bolt holes lined up. Get one with the same bore diameter as you have on the old unit now. Dont get one that is bigger or smaller, or you'll be sure to have some brake pedal issues. You will end up buying two master cylinders if you get a bore size under one inch. There is nothing 'power' or 'manual' about any master cylinder. They simply operate the opposite of your wheel cylinders. Some M/C's included a residual valve but most didn't. The idea of one reservoir being larger than the other is because calipers use far more volume than wheel cylinders. So, the large reservoir gets plumbed to the front brakes. If both reservoirs are the same size (usually both large), plumbing to front or rear just doesn't matter. I support Howard Prout's post, but I believe the M/C bore he is using is 1". Howard has been down this road with both manual drum and power disk brakes. He has a Squarebird with 430 and A/C, which is the worst combination for brake retrofit because of tight real estate at the firewall. Howard is a skilled engineer who fabricated his system and he is using MBM/Scarebird products for a very successful Power Disk Brake setup that he has run for two years. Listen to his advice. This 'brake system' business is much more technical than it appears. When all your brake cylinders were plumbed together, it didn't matter if one or more are out of adjustment. When you split the system using a dual reservoir, now it matters. For example, what happens when the front shoes are engaging but the rears aren't quite there yet? Hydraulic fluid will not compress, so you will lock up the front wheels and the rear brakes will be useless. What is the difference between a power brake master and a manual brake master cylinder? As a general rule, a power brake master cylinder will have a larger bore diameter than a manual brake master. A manual master will also usually have a deep piston hole to accept the manual brake push rod while a power brake master will normally have a shallow hole. Also consider early drum applications used differing size wheel cylinders/brake lines for proper brake balance before valving became popular. Been there - done that - it wasn't pretty or safe looking IMHO. All the disc / drum master cyls I found only used 2 of the 4 bolts on the original booster. I bet there was a reason for using 4 smaller bolts rather than just 2 of them. Get Booster Dewey to replace the face on your booster with a 2 bolt style or find a replacement and DIY. Pretty sure the '61-64 Lincoln booster face fits the standard Bendix under the hood booster - it looks identical - just haven't tried it. I think that's what Dewy uses. Grant has taken his booster apart and said it appears you could modify your own with the 2 bigger bolts then cap off the other 2. X2 on the proportioning valve - I have one and don't have nay problems with nose dive or unbalanced pulling. and BTW - I converted my car to discs in 2004............that's 8 years ago - still working fine. Last edited by DKheld; April 9th, 2012, 08:29 AM. I thought it was going to be a simple affair; just swapping out the single MC for a dual MC. It looks like (for now) I’m going to repair the brake system as factory intended. Right now I have no brakes. I need to get the car road worthy and safe by Jun, 10. I just can’t swing the cash right now for the disk brake conversion, so that will have to wait until the winter time. At the moment, I don’t trust any of the old brake components, so the brake lines, brake hoses, brake shoes, wheels cylinders, spring kits, and master cylinder are getting replaced. The good news is that I have some new parts left over from the first T-Bird so that will bring the cost down a bit. I’m having trouble finding a master cylinder on Rockauto. It lists all their master cylinders for my car as being for manual brake cars. I don’t see why there would be a difference in the two . The reason you are seeing the reference to Manual brakes is due to Ford specifications. For Thunderbird model year 58 and 59 the Master Cylinder bore is listed as Conventional Brakes, 1" dia, Power Brakes 1.125" dia. By 1960, 1" dia was listed on both braking systems. If you look at your Master Cylinder, the bore diameter is cast into the side of it, probably 1". That's the history as I know it, you will be fine with the MC listed for manual brakes as it's true to spec for your car.